The United Church of Canada was formed in 1925 through a union of the Methodist Church, two-thirds of the Presbyterian Churches, and the Congregational Union of Ontario and Quebec churches in Canada. The official Crest was designed by the Reverend Dr. Victor T. Mooney, a Treasurer of the United Church, and officially adopted in 1944. Its oval shape is derived from the outline of a fish which was used as a symbol of identity by early Christians. The initials of the words “Jesus Christ, Son of God, Savior” spell the Greek word for “fish”. The “X” at the center is the first letter in the Greek word for Christ, and is a traditional symbol for Christ. The open Bible represents the Congregational Churches with their emphasis on God’s truth that makes people free. From this communion we have a heritage of liberty in prophesying, love of spiritual freedom, awareness of the creative power of the Holy Spirit and clear witness for civic justice. The dove is emblematic of the Holy Spirit (Mark 1:10) whose transforming power has been a distinctive mark of Methodism. Here our heritage is one of evangelical zeal, concern for human redemption, warmth of Christian fellowship, the testimony of Spiritual experience and the ministry of sacred song. The burning bush is the symbol of Presbyterianism. It refers to the bush that burned and was not consumed (Exodus 3:2), and symbolizes the indestructibility of the Church. From Presbyterianism we have received a heritage of high regard for the dignity in worship, the education of all people, the authority of scripture and the church as the body of Christ. In 1980, a French translation of “The United Church of Canada” was authorized by General Council to be added to the crest (“l’Église unie du Canada”). In August of 2012, at the 41st General Council held in Ottawa, Ontario, the United Church of Canada acknowledged the presence and spirituality of Aboriginal peoples in the United Church by revising the church’s crest. The crest changes included incorporating the four colours of the Aboriginal medicine wheel (yellow as a symbol of life and Asian people, black as a symbol of the south and dark-skinned people of the world, red as a symbol of the west and Aboriginal peoples, and white as the colour of the north and white-skinned people), and adding the Mohawk phrase “Akwe Nia’Tetewá:neren”, which means “all my relations”. For more detailed information about the United Church, please click on one of the following links. The United Church Of Canada official Home Page. Information about and from the National Office of the United Church of Canada and links to other church sites. 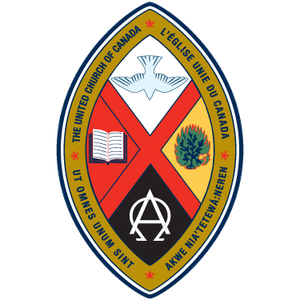 The Crest of The United Church Of Canada. The United Church Of Canada Common Links Page. Wondercafe. A United Church Of Canada sponsored website which allows people to explore their spirituality and some of life’s big questions. The Observer: The Official Monthly Magazine of The United Church Of Canada. The Ottawa Presbytery Home Page. A listing of all United Churches in the Ottawa Area, Youth ministry in the Presbytery, church humour, and links to other United Church sites.